Long lines formed in the Capitol Rotunda as Americans and world leaders filed through to remember the former president. WASHINGTON – Soldiers, citizens in wheelchairs and long lines of others on foot wound through the hushed Capitol Rotunda on Tuesday to view George H.W. Bush’s casket and remember a president whose legacy included World War II military service and a landmark law affirming the rights of the disabled. Bob Dole, a compatriot in war, peace and political struggle, steadied himself out of his wheelchair and saluted his old friend and one-time rival. Bush’s service dog, Sully, was brought to the viewing, too – his main service these last months since Barbara Bush’s death in April being to rest his head on her husband’s lap. Service dogs are trained to do that. 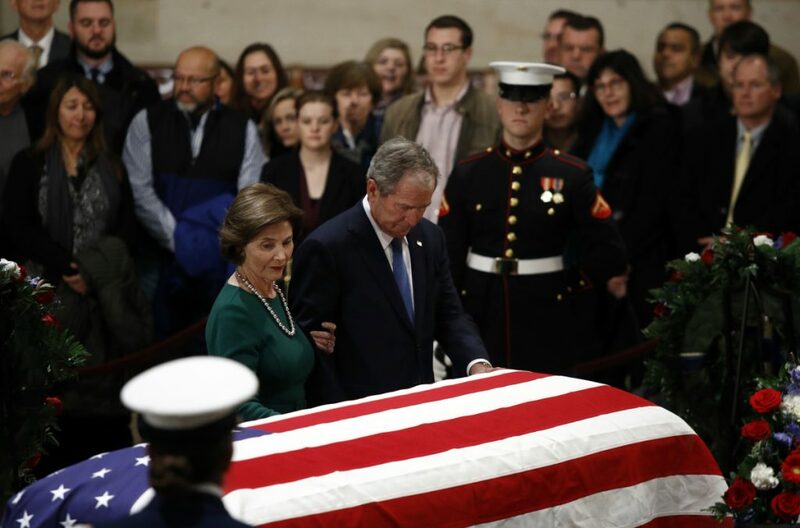 Former President George W. Bush and former first lady Laura Bush pause in front of the flag-draped casket of former President George H.W. Bush as he lies in state in the Capitol’s Rotunda in Washington on Tuesday. Although President Trump will attend Bush’s national funeral service Wednesday, he is not among the eulogists announced by the Bush family, a list that includes George W. Bush. The others are Alan Simpson, the former senator and acerbic wit from Wyoming; Brian Mulroney, the former Canadian prime minister who also gave a eulogy for Ronald Reagan; and presidential historian Jon Meacham. Jenna Bush Hager, center, and her husband, Henry Hager, left, and her twin sister, Barbara Bush, right, pay their respects to their grandfather, former President George H.W. 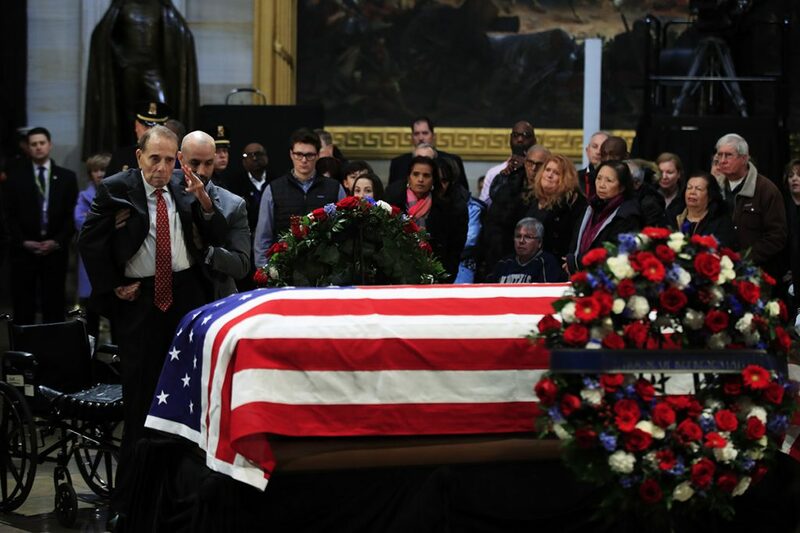 Bush as he lies in state at the U.S. Capitol in Washington on Tuesday.